Our first demonstration of the New Winter Program and we are all really looking forward to a brilliant evening with Joe Dowden. Our new Chairman, Colin Mossman is a friend of Joe and has lead us to believe that he is a brilliant artist, nice man and Colin himself is looking forward to catching up with Joe. Well not everything goes to plan as we found out last night…. The day before Joe is coming to visit our Club, Colin is given an appointment for an operation so is now going to miss the demonstration that he has been looking forward to. We have taped the demonstration Colin so you will get a chance to see it eventually. Meanwhile we all wish you well. Joe had said he would be an hour early at the hall so as to be set up and ready to go when we all arrived. That too was not going to happen, we got a telephone call from Joe to say he had been held up on the M25 at the Dartford Tunnel and so ended up arriving at the hall about 7.45p.m. Meanwhile we had done the raffle, chatted for England and all had a cuppa. We are resourceful if nothing else us Brits. 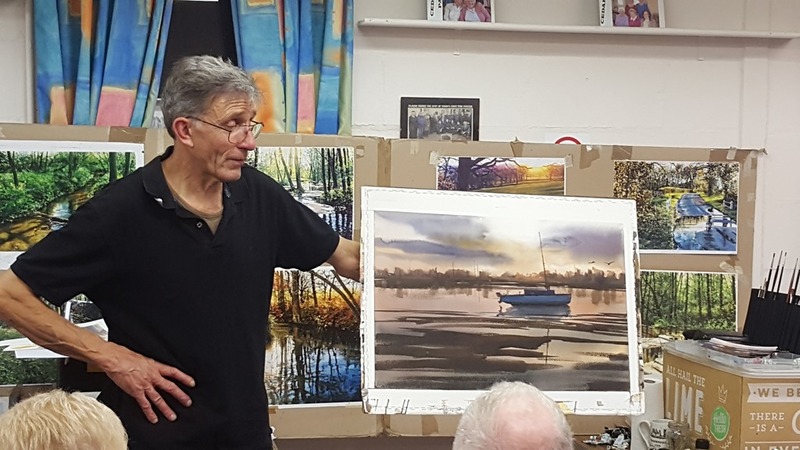 With a large sheet of Fabiano paper and a vote from the members, Joe started a painting of a river view at sunset. Using a photographic tripod and a board which had an attachment on the back to fix it to the tripod, Joe put plenty of water onto the paper which was flat but leaving a double diamond shape in the sky dry. He then did a strong wash over almost all of the paper with Naples yellow leaving the diamond shape still white but wetting the inner diamond with plain water to keep it moist. This will give the sky the dynamic sun later. Making greys with a warm shade of red to them, Joe put plenty of paint along the bottom of the picture making his way up towards the horizon. Once he was satisfied with the amount of colour on the paper he removed the masking tape from around the outside of the paper to let the pigments spread and then he dried the paper with the use of 2 hairdryers. While the paper was drying, Joe entertained us with jokes some of which were really quite funny and definitely made the drying time go in a flash. Using colours like Windsor Blue, Phthalo blue, Vermillion red, Quinacridone Magenta and Naples yellow, Joe re-wet the paper once again and made more mixes of paint and reapplied across the picture. He said that Fabiano paper was brilliant for this method of painting but Bockingford could also be used quite successfully. The sky area was painted with a mix of Cobalt Blue and Naples Yellow to one side and then moving to the other side of the sky he added Aussie Red Gold with a touch of Vermillion and Magenta. He then re-wet the soft edges of the clouds in the sky so there were no hard edges. Looking really good now. Next the boat, then he turned the painting upside down and painted the horizon line. Now to add the long mud banks and the foreground mud which was done with Red, Black and Green with a touch of Neutral Tint. Wow! We may have had to wait for Joe to arrive but my goodness it was a brilliant demonstration, with a really lovely picture at the end of the evening and Colin was right, Joe is a very nice, easy to watch demonstrator. Probably several of us will have a go at this way of painting as it was really inspiring but as to how many of us end up with a real muddy picture is anybody’s guess. 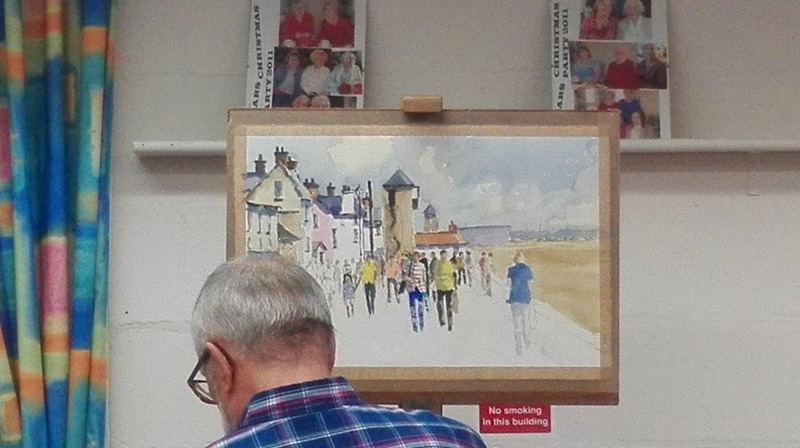 Rayleigh Art Group will be hosting a watercolour demonstration by Joe F Dowden tomorrow evening (Wednesday 8th November). The demonstration will be in the Cedars Centre, Castle Road, Rayleigh SS6 7QF, starting at 7:30pm sharp, so please arrive soon after 7:00pm. Guests are welcome to participate for a small charge of £4.00. 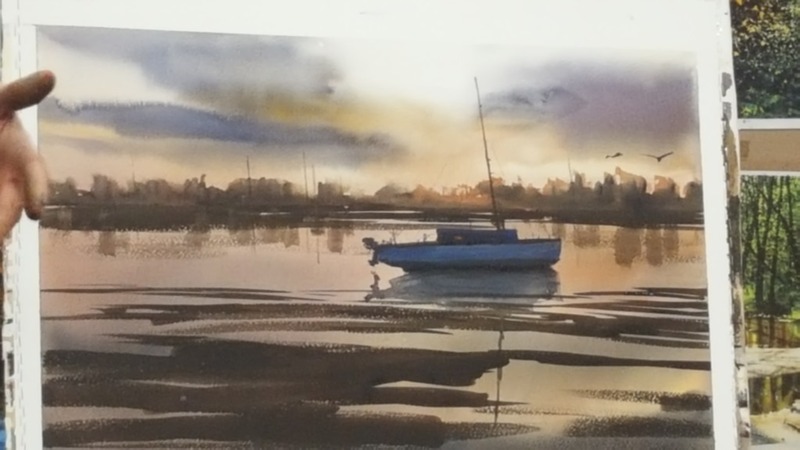 Joe is a Landscape and Seascape Painter and has exhibited at the Singer & Friedlander/Sunday Times Exhibition, Royal Institute of Painters in Watercolour, Laing Art Exhibition, Chichester Open, Barings ING – Platform 100, World of Drawings and Watercolours, British Modern Masters, Royal Society of Marine Artists. Stages one man shows at Albury, Southern UK. Paintings sell at Elford Fine Art, Fine Art UK & British Modern Masters 2008. Author of books and magazine articles. Published worldwide. Presents TV, DVD, seminars, demonstrations and he is a Panel Member of the SAA. Our first evening back in the new year’s calendar and how nice to have one of our own members to do a demonstration for us. Ian Deaves has been a member of our Club for many years now and is known for his watercolour and acrylic paintings. He paints quite prolifically and brought many examples of his work in watercolour with him for us to look at. Many of Ian’s paintings are of local scenes and most of those are in Rochford, all very recognisable to many of us. 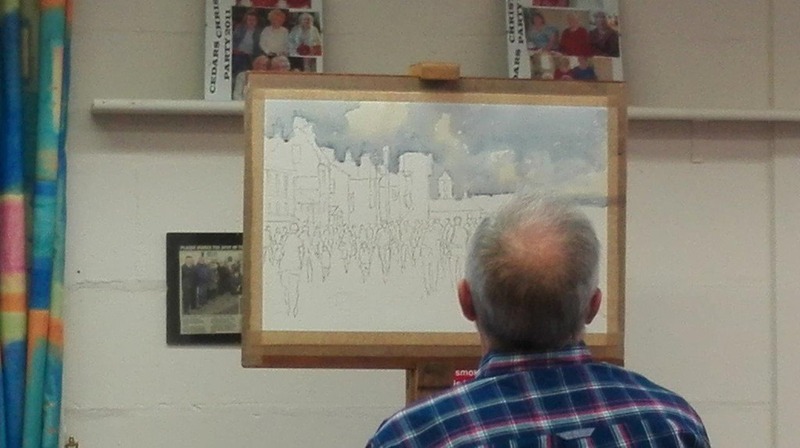 With a drawing of South Street, Rochford already in place on a piece of Bockingford Watercolour paper, he was ready to start. 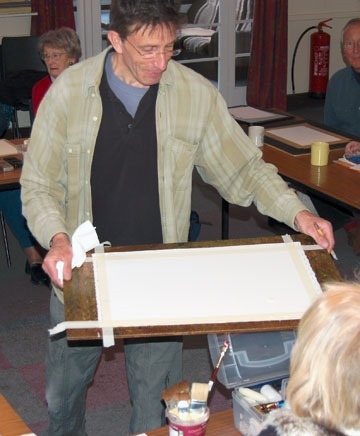 The paper was not stretched as someone had suggested to Ian that after you paint on a piece of watercolour paper and then turn it over and wet it all over, the paper will dry flat and will be ready to mount. Apparently he has found that this works so no more stretching of paper for Ian. A tip worth trying I should imagine, especially if you are caught short and want to just paint and can’t wait for paper to dry. Ian began by putting in the sky. Not an easy task with the board in such an upright position as he said himself, the paint runs! Using Cobalt Blue with Cerulean Blue he was off to a good start. Putting in a very large brown tree next, Ian explained that it was the light buildings against the darkness of this tree that drew him to paint this picture in the first place. 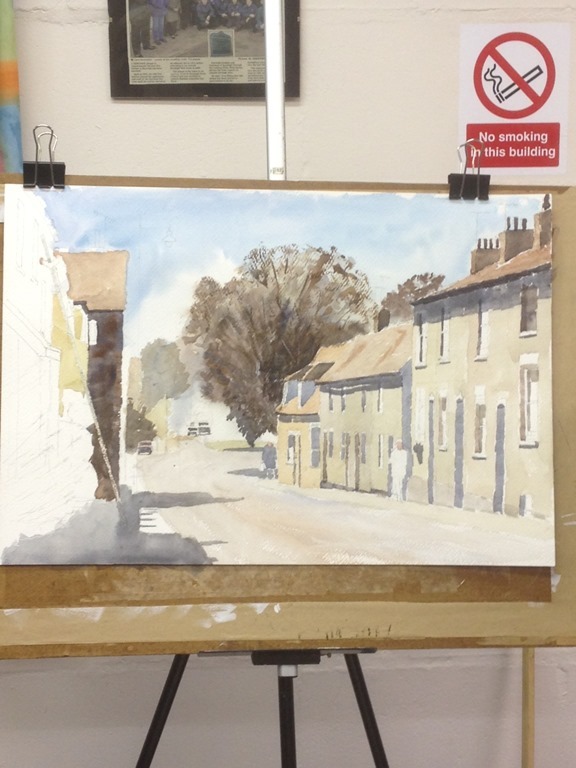 Next on with the road colour and then on to some of the buildings, Ian worked away until tea break. Having had a break and most of us having a good look at his other paintings he had brought along together with a closer look at the picture of the evening we all settled down to watch a bit more of the picture appear. We watched as many doorways and windows appeared and what looked like a black shiplap building emerged on the left hand side of the picture. This building was painted in using a dark mix and then spritzed with water to give a textured look to it. The picture didn’t quite get finished and so Ian will show us when he has completed the picture as we were all interested to see the finished article. Lovely demonstration Ian, thank you very much. A nice way to start the new season as I said at the beginning of my report. Members are advised that the Rayleigh Art Group Winter Programme starts again with a Workshop on Wednesday 13th September 2017. This will be followed by a Demonstration by Ian Deaves in Watercolour (subject to be advised) on Wednesday 27th September 2017 – a full list will be issued in the near future when it is finalised. Members are also reminded that Subscriptions are due by the first Demonstration on Wednesday 27th September 2017 and this year will be £26, payable to Rayleigh Art Group. Members can pay Val Belverstone on the Workshop or Demonstration or send a cheque by post. This demonstration was rather nice as it was like meeting up with an old friend. We have had Bill come and do demonstrations for our Club in the past but not for a few years so very nice to see him once again. Bill had pre-drawn a scene of Aldborough, Suffolk, it was drawn in pencil and was taken from an old photograph which he had brought along to show us. This was a very dull photo taken in the rain and with only a couple of people in the picture. 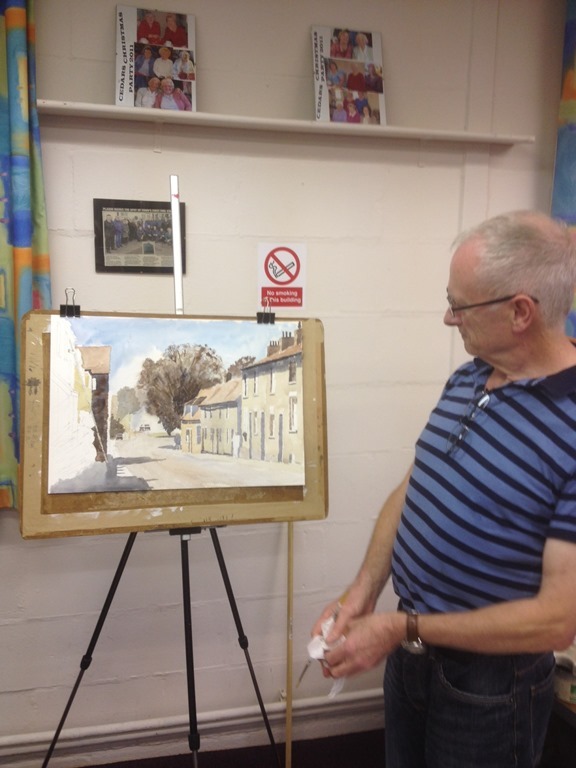 From this, Bill had previously painted a rainy day in Aldborough and tonight he was going to paint the same scene but with many more people as a sunny day picture. All good so far, Bill started by explaining that he would not normally paint with his paper upright, it would be flat and therefore the paint would not run in the same way as it was about to tonight. With this in mind he put in raw umber and cobalt blue in very wet and then kept dabbing at the dripping paint to stop it running into the skyline of buildings. Having cracked that Bill then painted in the arms, legs if they were bare and heads of the people in the foreground, this was to give him and idea of where things were in the picture. Now off to the buildings, roofs, chimneys and building walls were coloured in taking out light bits by using a dry damp brush giving a direction of where the light was coming from. All was looking very good by the time tea break came up. After tea Bill continued to fill in the people, they soon became really colourful and brought the whole painting to life. During the evening Bill had passed round photographs of some of his paintings he has done and drawings in several books. These were very interesting to see and probably gave us the idea that we really should do more drawing and sketching. 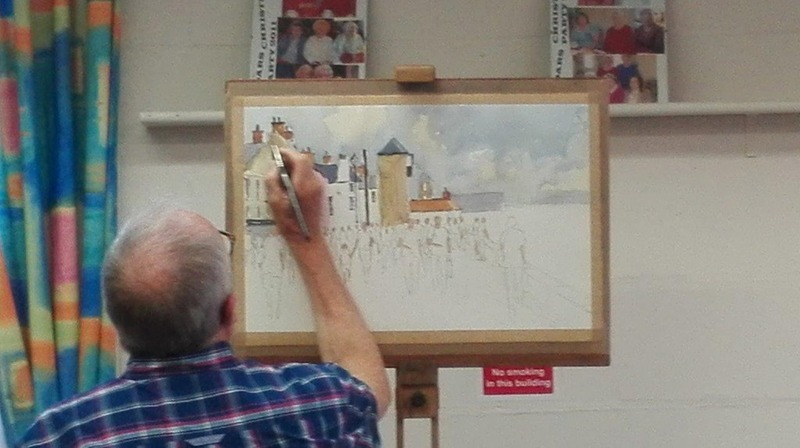 It was a lovely demonstration and we probably all wish we could paint as freely as Bill does. Keep trying, you never know we might just get it right one day. 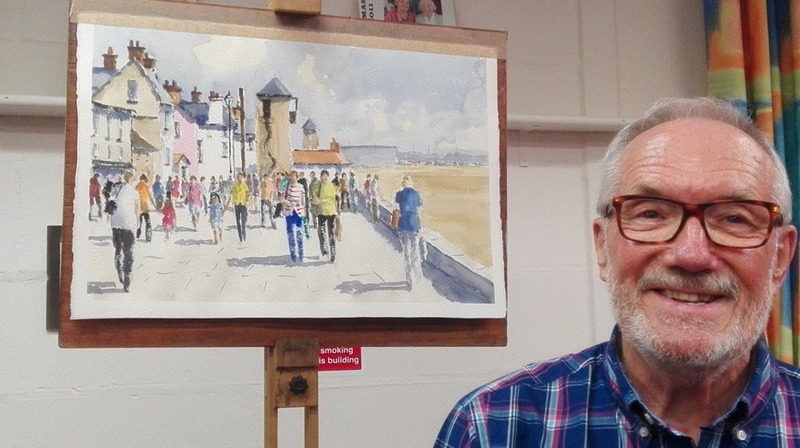 Next Wednesday 24th April, Brian Coppard will be taking a tutored work shop, the subject is ‘ An animal portrait in watercolour and gouache on pastel paper. You will require a reference photo (Brian does have some if you do not have anything suitable) pastel paper, watercolours and/or gouache. Brian will have some pastel paper and gouache with him if needed. If you would like to book a place(there are only four spaces left) please call Val Belverstone on 01268751087. For all other coming events check your membership card or consult the calendar on this website. All meetings are held on Wednesday evenings between 7.30 pm and 10.00 pm, at The Cedar Centre, Castle Road, Rayleigh, SS6 7QF unless otherwise stated.